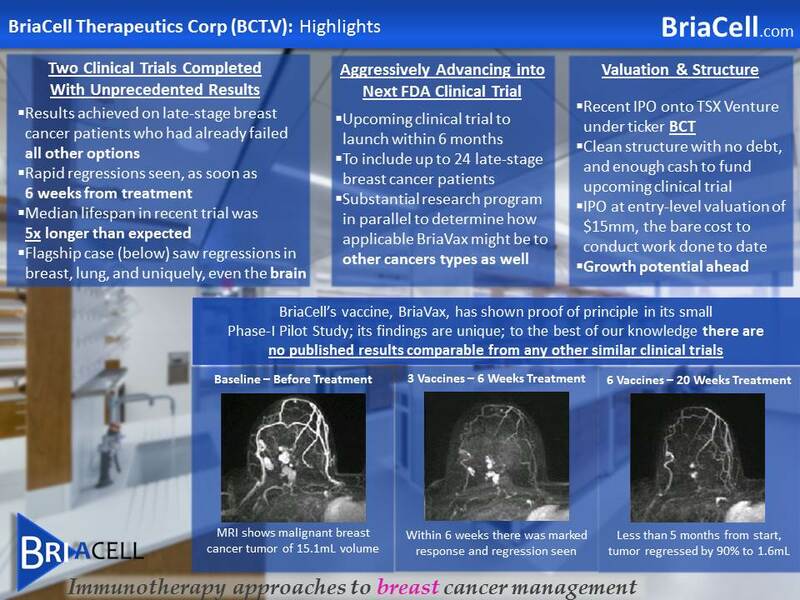 January 07, 2015 09:30 ET | Source: BriaCell Therapeutics Corp.
VANCOUVER, BC--(Marketwired - January 07, 2015) - BriaCell Therapeutics Corp (TSX VENTURE: BCT) ("BriaCell", the "Company", or "BCT") is pleased to announce that it has formally engaged Dr. Steven J. O'Day as Principal Investigator for the Company's upcoming BriaVax™ vaccine clinical trial. Dr. O'Day is a highly specialized oncologist with a history of leading successful clinical trials, having been educated and trained at Johns Hopkins, Harvard, and Oxford. As BriaCell's Principal Investigator, Dr. O'Day brings a track record of experience as the Principal Investigator on over 100 clinical trials including several large, international Phase III clinical trials. Dr. O'Day served as the Principal Investigator in Bristol-Myers Squibb's Phase III clinical trial for its Yervoy, widely heralded as a scientific breakthrough. The renowned clinical trial, which included 676 patients, saw a significant improvement in overall survival for late-stage melanoma patients. Yervoy became the first and only drug ever to extend survival in patients with advanced forms of melanoma. Yervoy has rapidly become the highest grossing melanoma drug in the US and major EU markets. In 2012, Yervoy sales were over $700m, and are forecasted to be $1b per year by 2018. Dr. Charles L. Wiseman, BriaCell's Chief Medical Officer commented, "Dr. O'Day is known as the very best of the best, and for those in the scientific community, he needs no introduction. I have always felt strongly regarding the importance of having a top caliber team. We may still be an early stage company, but I believe we are building a highly specialized team capable of advancing our promising vaccine as effectively as possible. We are thrilled to have Dr. O'Day on board." Dr. O'Day is recognized as one of the preeminent cancer specialists in the world, and combines expert clinical care with teaching and leading clinical research. He lectures extensively, both nationally and internationally. His research has focused for many years on the combination of chemotherapy and immunotherapy in the treatment of metastatic cancers. He has been at the forefront of new drug development in over the last two decades. He has published more than 200 manuscripts, abstracts and reviews in prestigious journals such as The New England Journal of Medicine, Journal of Clinical Oncology, Blood, Journal of American Medical Association, Lancet Oncology and the Journal of the National Cancer Institute. He serves on the editorial boards and as a reviewer for many prestigious journals including JCO and Clinical Cancer Research. Dr. O'Day has served on the ASCO Education Committee for melanoma. In addition, he has served on the ASCO International Development and Education Award (IDEA) Working Group where he has served as a mentor for an IDEA grant recipient as well as an IDEA grant reviewer. Dr. O'Day has regularly been interviewed and cited by the media, and was recently quoted in a Bloomberg article on immunotherapies. Dr. O'Day attended medical school at Johns Hopkins University and subsequently completed his fellowship in Medical Oncology at Harvard University. Dr. O'Day also studied Medical Ethics at Oxford University. 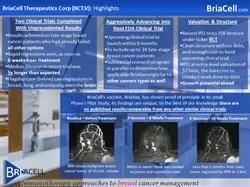 BriaCell is a breast cancer immunotherapy biotechnology company. Immunotherapies have come to the forefront of the fight against cancer, because they harness the body's own immune system in recognizing and selectively destroying the cancer cells, sparing normal ones. Immunotherapies are believed to be a more targeted, less toxic approach to managing cancer. This approach is also more likely to prevent recurrence and is not expected to produce the serious side effects seen with chemotherapy. The Company has demonstrated unique and unprecedented results, and is intent on building upon these results to further advance BriaVax™ through the FDA Clinical Trials in order to help cancer patients with no other options. The results of two FDA Phase I clinical trials have been encouraging in terms of both safety and efficacy in patients with advanced, stage-IV breast cancer. Most uniquely, BriaCell has achieved these results in patients who had prior failed all other available therapies including various kinds of chemotherapy. In some cases, the lifespan was five times longer expected. The results were targeted, with little to no side effects, and were achieved rapidly, with regression occurring within 6 weeks. In one patient, cancer regressed in all sites to which the cancer had spread, including lesions in the breast, lung, and even brain. This result was the most unique finding, given that the brain is largely considered an untouchable site in terms of cancer regression. Again, results were seen rapidly and with little to no adverse side effects. The Company also announces that it has granted, pursuant to its stock option plan and subject to regulatory approval, an initial 2.5m options to various directors, employees, and/or consultants at an exercise price of $0.22 per share for a term of three years. The securities represented by this grant will be subject to a four-month hold period.